In this exclusive webinar, Findmypast's in-house military expert Paul Nixon explains how to uncover clues in your old military photographs, which in turn open up further avenues of research. 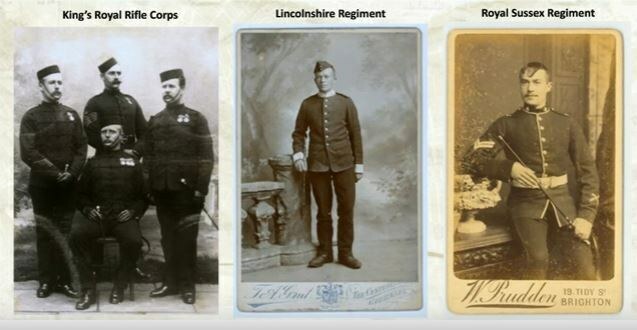 Using resources from both our military records and newspapers, Paul will explain how you can piece together the remarkable stories of your British Army ancestors. No problem. We've summarised Paul's three top tips below, so you can start deciphering your vintage military photographs at your leisure. There are several identifying features in old army photos that can help you make sense of it. Look closely at collar, cloth and cap badges, accoutrements, jacket and trouser pattern. Don't forget to check the back of the photograph for more information and make a note of the photographer and location as old miiltary pictures were usually branded. All of these unique signs could help you understand which army regiment a soldier served in and what rank they were. Examine the photograph in detail to see if you can identify the medals (if any) in it. If you can successfully recognise a medal, it will tell you what conflict the solider served in and what award they won. You need to scour the photograph in it's entirety to see if there are any other features that will reveal more details about it. Is there a newspaper or poster in the picture that has a date on it? Maybe the photo was taken near a clearly identifiable landmark or includes some other clue that can help you pinpoint it to a specific date range or place. Start with these basic steps but for expert insights, make sure you get a chance to watch Paul's webinar in full. He will have you turning super sleuth on your old military photographs before you know it.